Thanks to one mother’s enlightened thinking, a canceled wedding resulted in a huge feast for nearly 100 of Sacramento’s homeless on Saturday. When Kari Duane learned that her daughter and groom-to-be would not be going through with the ceremony, she decided to put that $35,000 reception to good use by inviting families who were going through hard times. The decision drew the diners to one of the California city’s best hotels. A grand total of 90 people—including parents with newborn babies— gathered at Citizen House hotel to dine on food from its four-star restaurant. 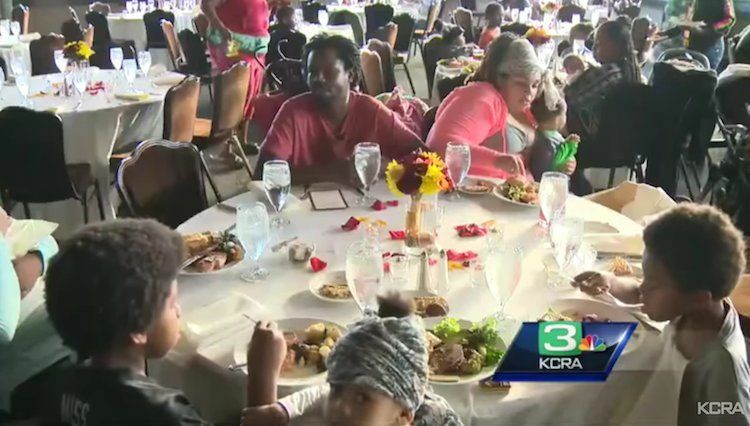 “When you’re going through a hard time and a struggle, for you to get out to do something different with your family is really a blessing,” Rashad Abdullah, a homeless man who attended the dinner with his family, told KCRA. For the bride’s family and so many others, Saturday still turned out to be a night they’ll never forget.